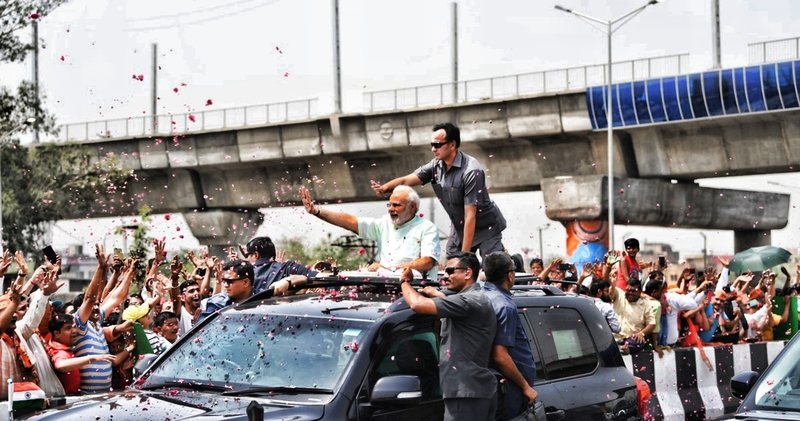 Narendra Modi held a massive roadshow to inaugurate a mere 8.3-km stretch of the 82-km highway. New Delhi: Given the elaborately choreographed roadshow Prime Minister Narendra Modi’ put on for the benefit of television to inaugurate phase 1 of the much-awaited Delhi-Meerut expressway one could be forgiven for thinking the wait for a quick drive between the two cities is finally over. In reality, however, nearly 90% of the 82-kilometre project is yet to be made operational. It emerges that Modi only inaugurated phase 1 (worth Rs 841 crore) of the Rs 7,500 crore project, a mere 8.36-km stretch within the borders of Delhi from Nizamuddin Bridge to the Delhi-Uttar Pradesh border. Beyond which, commuters to Meerut from Delhi have to continue on the congested four-lane National Highway 34. The prime minister also claimed that the first phase had been completed in a ‘record’ 18 months. In fact, Modi himself laid the foundation stone for the project in December 2015, 30 months ago. Three phases of the six-lane expressway – UP border to Dasana, Dasana to Hapur and the greenfield phase from Dasana to Meerut – are yet to be completed. According to R.P Singh, project director at the National Highways Authority of India (NHAI), of the Delhi-Meerut expressway, only 31% of the 82-km expressway has been constructed to date. “The first phase has been completed entirely. The second phase is 15% complete. While the second and third phases are at 60% and 3% level of completion,” said Singh. In effect, only 25.57 km, or 31%, of the total planned expressway was completed when Modi ‘dedicated’ the ‘built expressway’ to the nation, with nearly 69% of the work yet to be completed. A majority of the built expressway is part of phase 1 to 3, which entails lane expansions and service lane building. Phase 4, the only phase which is entirely greenfield, and also the longest phase of the expressway, is only 3% complete, with land acquisition hurdles pending. “There are some small pockets where land acquisition is yet to be completed in phase 4,” Singh said. Phase 4 of the Delhi-Meerut expressway has been caught in land acquisition hurdles in Ghaziabad district several times in the past. An administrative official aware of the land acquisition processes in Ghaziabad told The Wire that the process could still take some time. “There are still some issues with land acquisition. It could take some more months for that to be completed. Construction can only begin after that. I can’t tell you for sure when the process will be completed,” the official said. Union transport minister Nitin Gadkari has claimed that the project will be completed entirely by March 2019. However, a NHAI official, told The Wire that that deadline was unlikely to be met. “It is a very ambitious deadline. Certain parts of the project are making slow progress. We would like to finish it by March 2019, but it looks unlikely,” the official said seeking anonymity. NHAI’s Singh was slightly more optimistic. “It is difficult to meet that deadline. But we are trying. Let us see if it happens”, he said.